Before June, the Ibirapuera park should have free access to wireless Internet. To prevent the online network gets into criminal hands, all users will need to register before the first access. The users must submit documents for identification and then they'll receive a username and a password to connect to the service, which will be free. The type of available access is not yet defined to the park. The Ibirapuera receives about 600 thousand people each month. The Bar Brahma has over half a century of life and great story to tell. Founded in 1948 in the heart of Sao Paulo, in it's most famous corner - the Avenida Ipiranga with the São João. The place was known as a place of intellectual people, politicians and musicians in the 50's and 60's. Important Brazilian people has been drinking on those tables. But from the 80's, the bar was declining to close the doors and change of name (and beer). But the nostalgy was recovered in 2001. 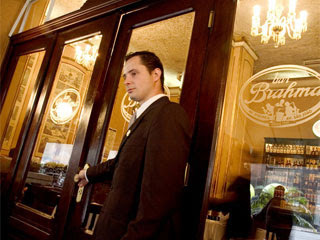 Today, the bar also serves pasta, snacks and receives artists every night. When: Monday and Tuesday, from 11:30am to 1pm; Wednesday and Thursday till 2am; Friday and Saturday till 3am; Sunday till 0am. If you enjoy a traditional "Roda de Samba", the Ó do Borogodó may be the best place for you. There comes a bit of each style of Brazilian samba, including the wonderful "chorinho". The groups playing over there are pretty good. Young people are most at home, but there is room for mature people. The livelihood is peaceful and harmonious. Saturday is the best day because on afternoon, the music runs together with a wealth feijoada. To ensure a table at the restaurant, it is advisable to arrive early. 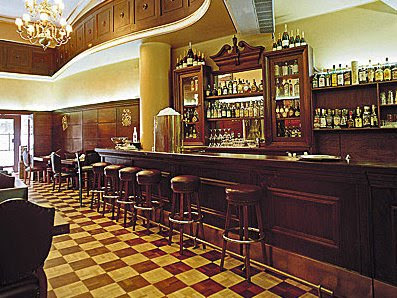 The international chain of pizzerias Piola is in São Paulo since 2004 showing his striking style. Coming from the Italian region of Treviso, it became famous for not following the traditional Italian style of canteens and pizzerias, the decoration brings strong colors, showing a cool environment and a well made menu. These elements introduce the restaurant as an ideal point for the young people. The features belong to the bruschetas and hors d'oeuvre, pasta and, of course, round in various flavors. Highlights for diavola, made with tomato sauce, mozzarella and spicy salame. It's impossible to forget the capricciosa, leading ham, champignon and carciofini. Delicious! When: Sunday to Wednesday, from 6pm till 1am; Tuesday to Saturday till 2am. 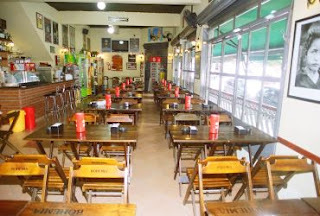 The name of the bar in Vila Madalena belongs to the main dish of the house: the Empanada. Dona Ivonete, present in the house's kitchen since the first day, is responsible for all the Empanadas: meat, chicken, cabbage, chicken with catupiry... This dish is quite common in other South American countries such as Chile, Argentina, Colombia and so on. 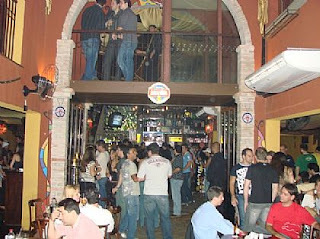 The public is composed of hippies and students and they are pretty faithful to this "Boteco". The tables outside the bar are of the most successful, especially on hot days. The bar has nothing special. 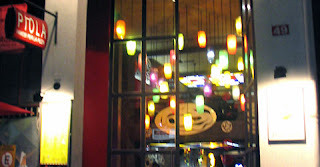 The decoration is made by bottles of drinks on display, several paintings on the wall and a typical bar counter. When: Monday to Tuesday, from 5:30pm till 2am; Friday and Saturday, till 3am. The artist Antonio Miranda made sculptures that reproduce "residents of the street" and exposing it in Avenida Paulista. On 26/01 a dummy representing a "collector of paper" made by resin was displayed in front of the Trianon with a boy. This representation shows a problem that nobody wants to see. Points to a misery that is in the streets of Sao Paulo and everyone ignores. First he tried to display at the free space under the MASP's Museum, but the security guards banned. Then he took out the pieces while some true beggars were seeing. The sculptures are part of the Collective exhibition Memórias do Futuro e os Traços da Arte, at the Galeria Café, in Vila Olympia, until the January 25th. 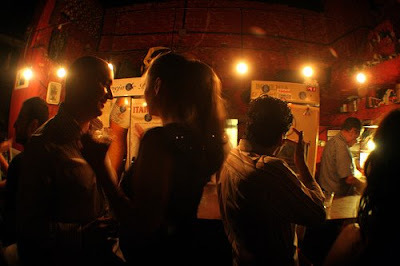 The bar tries to mix the Arabic culture with the brazilian style. The main point is the dance floor completely closed playing techno sound and black music. There are daily presentations of the arabiac belly dance. Live bands play and have a repertoire ranging from Arabic to pop, rock and techno. The kitchen offers Arabic snacks, such as cigar in grape leaves, falafel and Arabic portion comprised Homus, baba ganuch and curd dry. Among the drinks, the figures the Bin Laden's one (shot of tequila gold, lemon juice and lemonade soda). The traditional arguile is offered to customers as mint and apple flavors - for an hour or two coals. In the Mooca's suburb, predominantly Italian, the people brings the Mediterranean style on their way to speak (and also gestures). In Liberty suburb, the accent sounds it's oriental influences. The immigrants and their descendents have helped give the cosmopolitan shape to this city. These stories are told at the Memorial do Imigrante, the old hostel that received the "new Paulistanos" from 1887 to 1978, in Mooca. On Sundays, visitors can take a 20 minutes walk in an old school train from the last century, simulating the departure of the old station Hospedaria de Imigrantes. This journey through time at this second-class train costs R$ 5. The museum also conducts tours on special ocasions. A place to learn how people get around in town is the Museu dos Transportes Públicos. That is the first tram in the country, pulled by donkeys. Pictures show how the Paulistanos lived without traffic jam at the time of cattle cars. Inside the museum, there are coachmen and boatmen drive licenses. A suitcase is one of the main attractions of the Museum of the Civil Police, where there are weapons, pictures and other curiosities about crimes. The object is part of a larger impact of the murders in the country. The "Crime da Mala" (briefcase's crime) happened in 1928. A husband, suspicious of the fidelity of his wife, pregnant, killed her and tried to ship the body to France. Because of the subject, people under 16 years is not allowed to get in. When: Tuesday to Sunday, from 10h till 17h. When: Tuesday to Sunday, from 9h till 17h. That is an amazing film about São Paulo produced by MPM Propaganda and sponsored by Sao Paulo Tourism Agency. The corner of Ipiranga Avenue and São João will be the starting point for a walk through the main sights of Sao Paulo, celebrating it's 455th anniversary. This bar sponsored by Brahma is well known as a 'bohemian redoubt'. The event includes a tour by bus and motorbikes, crossing the Ponte Estaiada, Ibirapuera's Park, Avenida Paulista, Luz, Mercadão and Historical Center. 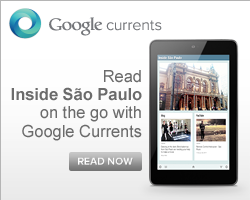 But the insidesaopaulo blog strongly recomends going by foot. For those interested on the tours should sign up untill Jan. the 21th. Flying above São Paulo could be a big suggestion to celebrate the city's anniversary. There is a trip that starts at Campo de Marte airport, in the northern zone of Sao Paulo, where the helicopters are. Depending on what you choose, you can fly over the Vale do Anhangabaú and Praça da Sé, in the central region of São Paulo; Avenida Paulista, the Ibirapuera Park and the Museum of Ipiranga, both in the South Zone of São Paulo. The overflight can be done during the day or the night. For those who want to take pictures, the suggestion is to fly during the day. It is an excellent option for anyone who wants to meet Sao Paulo through this way. This sea of concrete can be seen totally during the flight. The flights of 30 minutes for two people cost around R$ 850. From January 19th to 25th, the Centro de Exposições Imigrantes will host the Campus Party Brazil. That's an event in which all of those Internet and blog users, crazy for technology and game addicted will be camping to be part of it. Will be 4 thousand guys camped out, in addition to an estimated 300 thousand visitors. The space will have access to the Internet with fastest broadband in the world, with up to 10 gigabytes. Tim Berners-Lee, the developer of the Web is the main character of the opening celebration on the Campus Party 2009 in Brazil next January 19 and will make a masterful conference about Web 3.0 on January 20th at 1pm. Beyond meetings with specialists in this area and stands with new technologies, there are attractions that should also attract the most laity. One area offers a walk on the earth, using an interface connected to the popular Google Earth. At night, telescopes will be available in the area specially developed to astronomy. The Campus Party is organized also in Spain and Colombia. This is the second edition in Brazil. The event is free and has transport from subway Jabaquara. When: Between January 19th to 25th From 10am to 9pm . 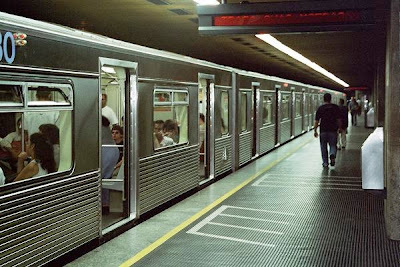 A suggestion of celebration for the 455th anniversary of São Paulo is the subway tour. It works on Saturdays and Sundays and you can join the tour by the subway tracks and learn about the history of Sao Paulo. The Turismetrô promotes five different routes, which pass through the main sights of Sao Paulo. An example of this tours is the Sé's one, that besides the cathedral, goes to the Mosteiro de São Bento, Largo do Café, Praça do Patriarca, Pátio do Colégio, Solar da Marquesa and cultural centers of Banco do Brasil and Caixa Economica Federal. The tours are also in English and have the history, legends and curiosities of the visited places. To help the tour, there are theatrical performances on some points representing the history in a fun way. These tours are organised by Turismetrô and works on Saturdays and Sundays at 9am and 14h, at the Station Sé. Groups may take up to 25 people, but there is no problem to follow the group if it's filled when you arrive. The price of the tour is the same passage of a subway, R$ 2,40, but the ticket must be purchased at the counter of Turismetrô, is in season.